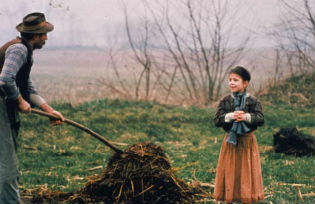 THE TREE OF WOODEN CLOGS won the Palme D’Or for Best Film at Cannes in 1978. 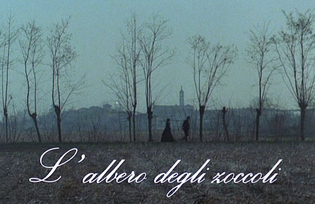 Using untrained actors from around Bergamo, speaking the heavy dialect of that region, it depicts the lives of a few families who share a large farmstead around the end of the 19th century. Peasant farmers, they work the land and tend the livestock for a landlord who cares nothing for their labour and conditions. They own little; even two-thirds of the harvest accrues to him. 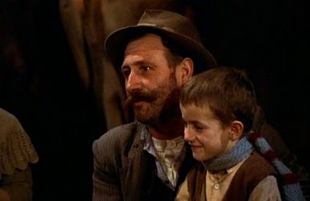 The harshness of these terms is exemplified in one strand of their story, to which the title of the film refers: at the start, one of the families is advised by the local priest that it is their duty to send their promising son to school. It is a six-kilometre walk and, later on, the boy’s clogs give out. The father cuts down wood from an avenue of pollards belonging to the landlord, to make a new pair. When the offence is discovered, the family are evicted. The film ends with the other families gathered in the courtyard of the farmstead to watch the gleam of the outcasts’ lantern vanishing up the track. Originally made for television, the film attracted a range of responses when it first came out. For some, it bore the stamp of a rather quietist Catholicism, perhaps present in the episode of the prayers of the widow who survives as a laundress. Her cow falls ill and the vet recommends she slaughter it at once. Desperate, she goes to chapel and asks that her prayers are answered: ‘You cannot refuse me this.’ She fills a fiasco with water from the stream and makes the cow drink it. Next day, the animal recovers. This is an extreme instance of faith working in a world where the disadvantaged are constantly enjoined to accept God’s will. For others, the film carried a Marxist message. The will embodied in the world was not so much that of God as of the rapacious landlord. Passages such as that involving the politicised orator who turns up at the merry-making of Carnival, or when a newly-married couple honeymoon in a Milan of civil unrest, make it hard to ignore such a concern on the director’s part. More, the title-story is an example of such injustice and ruthlessness, that it is difficult not to place it right at the heart of the film’s meaning. In this meditated and moving work, perhaps what is going on is a complex dialogue between the two positions, both of which the director, Ermanno Olmi, apparently holds. The character of the father of the evicted family, Batisti, is, in this context, subtly drawn. He is spirited, talented and likeable, with a deep affection for his family. He also fulfils an important function in his capacity as a maker of rhymes and stories. We feel, along with the families, the warmth and spice they bring to the winter’s nights. Yet who could forget the dejected droop of his shoulders as he watches the bailiff repossess the landlord’s animals, before he leads his blameless family out into the road and the night? His gift of imagination led him to transgress for them, aware of the consequences yet determined to defy the order which says his son should not have an education for want of a pair of shoes. Similarly, in wealthy Milan, the demonstrators with natural justice on their side are led through the streets in chains. Unhappily, when the ‘what ifs?’ of the mind become initiatives in the world, nothing protects the instigators from becoming victims. But it must be repeated that, as in the episode of the widow’s cow, this is a world in which faith can have very real outcomes. One of the costs of the imagination is a questioning faith, and this is true of Batisti, while his wife has belief enough for both. Expecting another child, he would like her to call in the midwife. Mindful of their circumstances, she is content to employ the offices of the women of the farmstead. ‘You took a risk,’ he says; ‘Babies come into the world of themselves,’ she answers. ‘Another mouth to feed,’ he goes on. ‘Remember your mother said: God gives each baby a bundle of their own.’ At no juncture are they disagreeing; it is like the point and counterpoint of the Bach organ music that is the film’s sound-track. On the road ahead, this family will need all his resourcefulness, all her faith. Despite the harshness of their immediate fate, there are grounds for hope in the story. How long will people be content with their lot when one of the lights has gone out of it? Without both bread and circuses the empire of Rome cannot continue. Which will run out first? (In our own day, it certainly looks like bread.) One feels that the more the human ‘excess’ that illuminates the film – the songs that accompany work, the rituals, the stories, the humour – is denied, the less an inhuman system is likely to survive. And then it would be difficult to ignore, in a piece imbued with such a strong sense of creation, a mythic element. There is more than a faint echo, in the ending, of expulsion from Eden, but an Eden where the lord is uncaring and unjust. Is it too fanciful to see in Batisti’s action a reversal of the myth, when man can finally chop down the tree of the knowledge of good and evil? To consider this is at least doing justice to the latency of meaning in such a rich work. As interesting and important an activity as it is to question possible meanings, the many and celebrated surface pleasures of the film seduce us into it. The life and rhythm of the peasants’ year hold a fascination which needs no gloss, and the wintry landscape with its palette of russets, whites and greens has been justly said to be a character in its own right. The whole is shot in virtually natural light, especially at night, where we experience a sense, as in the scene on Christmas Eve, of that increasingly rare and mysterious thing, the natural night sky. If there is one quality that marks the film apart, it is that of tenderness, a fairer word than the lyricism of which it stood accused by its sterner left-wing critics. It is indeed exceptionally valid in a piece which contains passages that present-day sensibilities find hard to accept, the slaughter of the pig, for instance. This is, surely, difficult to watch, yet to exclude it would have been false to its importance in the economy and life of the contadini. What a rewarding piece of work this finally is! alive with its subject, as obdurate and sensitive as the land it depicts, as unflinching and quiet as the toil it portrays. For anyone yet to see it, the light alone is worth the visit.